The term water-soluble polymer encompasses a wide range of synthetic, semisynthetic, and natural materials. Although they differ in molecular structure, these polymers share an important attribute: all are soluble in water, at least under some conditions. For the family as a whole, the range of applications is broad, but individual polymers generally have a smaller set of end uses. Water treatment is the single most important end use for water-soluble polymers, especially synthetic materials such as polyacrylamide. In developed nations, the municipal, wastewater, and industrial water treatment markets are large and well-established; therefore, the outlook for consumption growth is moderate. In contrast, demand growth in China will be more robust, stimulated by the government's growing attention to water resources. Water-soluble polymers perform various useful functions such as thickening, gelling, flocculating, rheology modifying, and stabilizing in any given application and are used for a wide variety of applications including food processing, water treatment, paper, enhanced oil and natural gas recovery, mineral processing, detergents, textiles, personal care products, pharmaceuticals, petroleum production, and surface coatings. Building products are an important end use for water-soluble polymers, especially polyethylene glycols and cellulose ethers. Polyethylene glycol is a starting material for polycarboxylate ethers (PCEs), a family of concrete additives. PCEs function as dispersants and water-reducing agents (superplasticizers) in concrete, improving its compressive and flexural strength. Demand for PCEs (and their polyethylene glycol precursors) will see above-average growth, especially in China and Other Asia, as PCEs replace first- and second-generation superplasticizers. Food applications—another major end use for water-soluble polymers—are dominated by natural water-soluble polymers, including casein, gelatin, xanthan gum, guar gum, carrageenan, and pectin. Some of these polymers provide physiological benefits (as dietary fibers, they help reduce cholesterol levels) as well as functional attributes. (They serve as thickeners and suspending agents in yogurt, almond milk, and other foodstuffs.) Demand for natural water-soluble polymers will benefit from major trends in the food industry, including consumer preferences for natural ingredients and foods that promote health and wellness. Oil field applications are also an important end use for water-soluble polymers, but demand from this sector can be volatile. In the past few years, comparatively low crude oil prices have reduced hydraulic fracturing (fracking) activity in the United States, depressing demand for guar gum and derivatives. In contrast, demand for polyacrylamide—widely used in enhanced oil recovery (EOR) operations in China—remains strong. The water-soluble polymers industry as a whole is fragmented, although a few producers have established leading positions for specific polymers. Major producers of synthetic and semisynthetic water-soluble polymers generally have manufacturing operations worldwide, allowing them to satisfy regional demand from regional production facilities. In the case of natural water-soluble polymers, the choice of manufacturing location is often driven by raw material availability. For example, many carrageenan producers are based in the Philippines, which has abundant seaweed resources. Most water-soluble polymers excluding starches remain specialty chemicals requiring technical service. Most manufacturers of water-soluble polymers provide technical service and product support; however, the intensity of technical service has gradually declined because the water-soluble polymer industry has matured. Reduction of production costs has become a key factor in determining profitability. 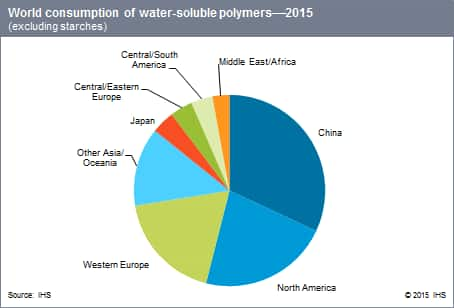 Continued growth in water-soluble polymer consumption is expected during 2015–21. In general, demand for water-soluble polymers is growing at rates near or slightly higher than the gross domestic product (GDP), particularly in regions with expanding manufacturing sectors. As manufacturing increasingly shifts from the United States, Western Europe, and Japan to other regions such as Southeast Asia and China, the world's highest growth is migrating to these regions as well. Increasing per capita consumption in economies such as China and Southeast Asia will also drive increased demand in segments such as food, personal care products, and pharmaceuticals.